Last week I was pretty down on Once Upon a Time. I wasn’t a fan of the whole Frankenstein storyline, but I knew I would have to move past it if I was going to keep watching the show. This week’s episode, “Tallahassee,” left me feeling a little better. The episode focused on the little-explored territory of Emma’s (Jennifer Morrison) past. While it answered quite a few lingering questions it also introduced some new and intriguing questions. Even though it was the second episode this season to not have Rumplestiltskin (Robert Carlyle) or Regina (Lana Parrilla), I was happy to see a focus on Emma. I had been feeling that Emma had been fading into the background this season, so it was nice to put her back in the forefront. This episode also seemed to indicate the show is still about her, which I was glad to see. Slowly a little focus is being introduced back into the show, and that’s what I was hoping to see. We knew from the early episodes of season one that Emma had some trouble in her past. We knew she had been in jail when Henry (Jared Gilmore) was born and that she’s had a difficulty forming meaningful relationships in her life. “Tallahassee” sheds some light on what went wrong for her. We still don’t know what her childhood was like, after she was left by Pinocchio in the foster home, but at 18 we learn she was petty thief. Well, maybe more than petty, since we see her attempting to steal a car. While she’s attempting this crime, she happens upon fellow car thief Neal Cassidy (Michael Raymond-James). The pair embarks on a crime spree of stealing junk-food from convenience stores. However, Cassidy is actually wanted for grand larceny and this is where things turn bad for Emma. She gets nabbed for being his accomplice and that’s how she ended up in jail, where she soon discovers she’s pregnant. All of that might not seem terribly interesting, but that’s because there’s much more to it than even Emma knows. This is where the episode gets good. So Emma and Neal are really in love, and despite being a thief, Neal doesn’t seem like all that bad of a guy. At one point in the show, Neal tells Emma he’s been suffering from nightmares. We really don’t think anything of it until much later in the episode when two other characters talk about nightmares (more on that in a minute). 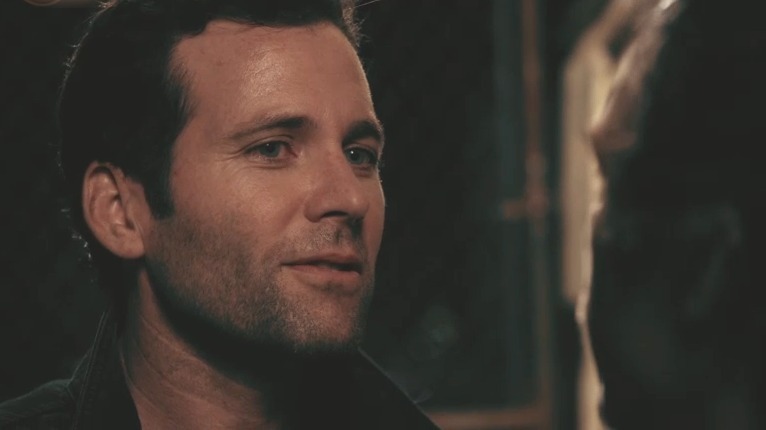 Emma convinces Neal to run away to Tallahassee with her, and he’s completely willing until running into August/Pinocchio (Eion Bailey). August has finally decided he must live up to his promise to get Emma to fulfill her destiny and he doesn’t think Neal is a part of that. I think he may have been wrong about that, but only time will tell. So why do I think he’s wrong? Because of the nightmares. Eleven years ago, Neal was having nightmares. In the current time, both Henry and Aurora (Sarah Bolger) are having nightmares. We don’t know what Neal’s nightmare was, but Henry and Aurora are sharing the same dream about someone staring at them in a red room with burning curtains. Of course, Henry and Aurora don’t even know each other. Henry is still in Storybrooke, while Aurora is in the un-cursed part of Fairytale land. She confesses her dream to Snow (Ginnifer Goodwin). The pair of them, along with Mulan (Jamie Chung), are waiting at the bottom of a beanstalk (as in Jack and the Beanstalk) for Emma and Captain Hook (Colin O’Donoghue) to steal a compass from The Giant (Jorge Garcia). The whole giant sequence was fine, but I was more interested in what was going on with Emma’s past. It was clever to show that she had some experience as a thief though. The special effects during the giant scenes left a little (okay, a LOT) to be desired, so it was best that those scenes were kept to a relative minimum. The most important part, besides Emma retrieving the compass, is learning about Aurora’s nightmare. What is looking at them in their dream? Who else might be having these dreams? I found that to be a cool new element to the show. In the past, Neal was quite upset about having to betray Emma. Another big question is what was in the case that convinced Neal that August was telling the truth about the curse? We didn’t get to see, but I hope we get to find out. I also have to wonder how Neal is connected to everything, besides presumably being Henry’s father. I mean he was having nightmares, so I’m assuming he must have some connection. He asks August to let him know if the curse is ever broken so he can see Emma again. August replies that he will send him a postcard. Clever. If Once Upon a Time continues in this direction, I will be happy. This was a good setup for some potentially cool stuff to come. They still need to work on tying everything together, and I think Regina needs more to do. But maybe things seem to be heading in the right direction.